Getting in the Halloween mood? 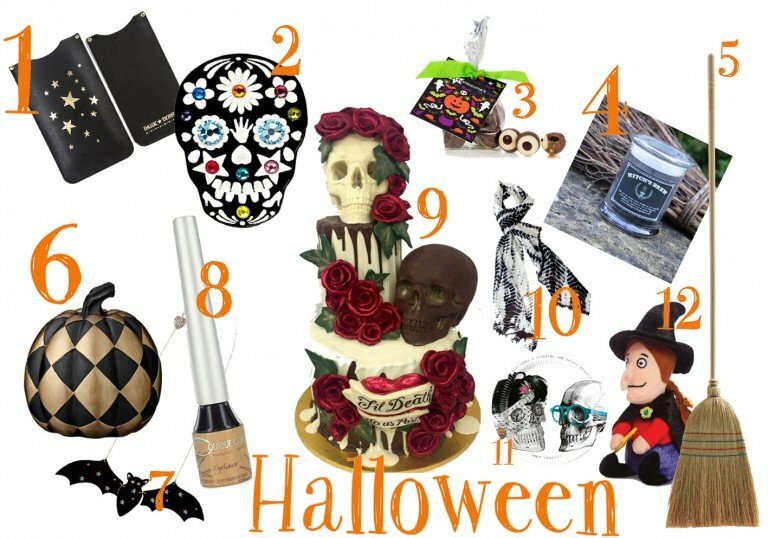 If you’re partying this season get ready to thrill with these spooky centrepieces and accessories from the Muddy Boutique and the magic of the tinterweb. This Mexican Day of the Dead inspired Sugar Skull ring, £35, from Tatty Devine is also available as cufflinks. Caramel goo-filled chocolate eyeballs are £4.99, from Montezuma’s, who also have skull shaped chocolate and vegan halloween treats. Witch’s Brew, Highgate Cemetery and Midnight Garden are the evocative names of the Black Apothecary range of aromatic candles, £13.95, from the Alchemistress. Witches Brew contains Patchouli, Cinnamon, Cedarwood & Cypress. Fashionably old-fashioned A.G.Hendy & Co in Hastings has this traditional rice straw broom, £20. It also sells vintage medicine bottles and botancial charts – perfect for party props. Among Rockett St George‘s Halloween-inspired homewares is this decorative pumpkin, £17, part of a range in gold or silver and black checks, spots and chevrons. Tatty Devine also has dramatic bat necklaces in black acrylic studded with Swarovski crystals, £65 or £35 for the mini version, plus ghost brooches and a necklace spelling AArrgghh! Create dramatic eyes naturally this Halloween with this organic liquid black eyeliner, £16, from Brighton-based Glow Organic. For a show-stopping centrepiece order a bespoke cake from chocolatier to the stars Choccywoccydoodah, or go a little cheaper with a £19.99 chocolate Head on a Stick edible skull or £12.49 chocolate gravestone. Cut a dash in x-ray style black and white with this cashmere shawl, £111, from the Muddy Boutique. Back at Rockett St George, grab some humorous Skeleton Crew paper plates for your party, £3.50 for eight. Cuddly Room on the Broom characters like Aurora, £6.39, are on sale on Eastbourne-based online bookseller Hive.co.uk which gives part of every sale to a local independent bookshop of your choice.